Franklin Tap hosts Candemonium! 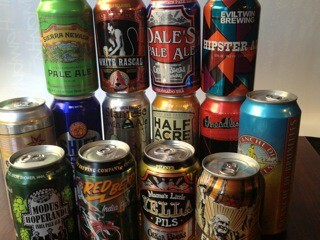 Canned Beer Festival from 11 AM to 11 PM. More than 35 craft beers from 22 breweries will be on hand for $4 apiece. Clinic performs at Lincoln Hall at 9 PM. Yeah, they still wear surgical masks. But according to Reader music writer Peter Margasak, Clinic feels "fresher than ever." He adds that the Liverpool band has "tweaked their tightly coiled hybrid of garage and Krautrock by playing with relatively poppy elements—sweeter melodies, gentler rhythms, lusher arrangements." So we'll let the masks slide. See Soundboard for more. Roosevelt University professors D. Bradford Hunt and Jon B. DeVries discuss Chicago's approach to city planning in a lecture titled "Does Chicago Plan Anymore?" at the Chicago Architecture Foundation.